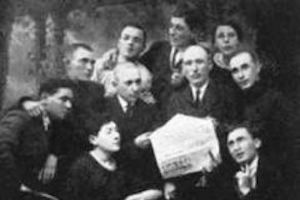 The concept of a National Jewish Home in Palestine as set forth in the Balfour Declaration was approved by the League of Nations Council on July 24, 1922, and endorsed by a joint resolution of the United States Congress on June 30, 1922. 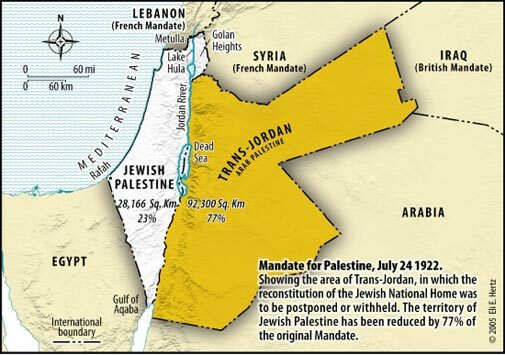 The "Mandate for Palestine" was issued by the League of Nations. The League of Nations made a clear decision in London on the 24th at 3.p.m due to the results of the San Remo Peace Conference that was held in 1920. Article 1 The Mandatory shall have full powers of legislation and of administration, saven as they may be limited by the terms of this mandate. Article 4 An appropriate Jewish agency shall be recognised as a public body for the purpose of advising and co-operating with the Administration of Palestine in such economic, social and other matters as may affect the establishment of the Jewish national home and the interests of the Jewish population in Palestine, and, subject always to the control of the Administration to assist and take part in the development of the country. The Zionist organization, so long as its organization and constitution are in the opinion of the Mandatory appropriate, shall be recognised as such agency. It shall take steps in consultation with His Britannic Majesty’s Government to secure the co-operation of all Jews who are willing to assist in the establishment of the Jewish national home. 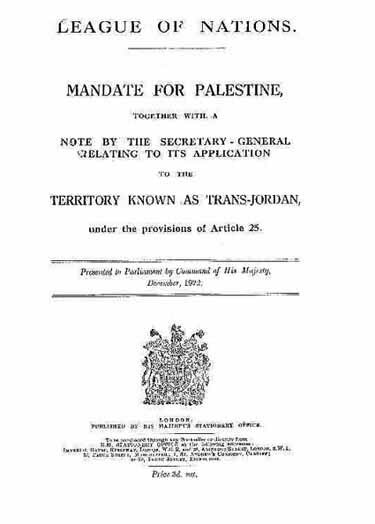 Article 5 The Mandatory shall be responsible for seeing that no Palestine territory shall be ceded or leased to, or in any way placed under the control of the Government of any foreign Power. Article 6 The Administration of Palestine, while ensuring that the rights and position of other sections of the population are not prejudiced, shall facilitate Jewish immigration under suitable conditions and shall encourage, in co-operation with the Jewish agency referred to in Article 4, close settlement by Jews on the land, including State lands and waste lands not required for public purposes. Article 8 The privileges and immunities of foreigners, including the benefits of consular jurisdiction and protection as formerly enjoyed by Capitulation or usage in the Ottoman Empire, shall not be applicable in Palestine. Unless the Powers whose nationals enjoyed the afore-mentioned privileges and immunities on August 1, 1914, shall have previously renounced the right to their re-establishment, or shall have agreed to their non-application for a specified period, these privileges and immunities shall, at the expiration of the mandate, be immediately reestablished in their entirety or with such modifications as may have been agreed upon between the Powers concerned. Article 9 The Mandatory shall be responsible for seeing that the judicial system established in Palestine shall assure to foreigners, as well as to natives, a complete guarantee of their rights. Article 10 Pending the making of special extradition agreements relating to Palestine, the extradition treaties in force between the Mandatory and other foreign Powers shall apply to Palestine. Article 11 The Administration of Palestine shall take all necessary measures to safeguard the interests of the community in connection with the development of the country, and, subject to any international obligations accepted by the Mandatory, shall have full power to provide for public ownership or control of any of the natural resources of the country or of the public works, services and utilities established or to be established therein. It shall introduce a land system appropriate to the needs of the country, having regard, among other things, to the desirability of promoting the close settlement and intensive cultivation of the land. Article 12 The Mandatory shall be entrusted with the control of the foreign relations of Palestine and the right to issue exequaturs to consuls appointed by foreign Powers. He shall also be entitled to afford diplomatic and consular protection to citizens of Palestine when outside its territorial limits. Article 13 All responsibility in connection with the Holy Places and religious buildings or sites in Palestine, including that of preserving existing rights and of securing free access to the Holy Places, religious buildings and sites and the free exercise of worship, while ensuring the requirements of public order and decorum, is assumed by the Mandatory, who shall be responsible solely to the League of Nations in all matters connected herewith, provided that nothing in this article shall prevent the Mandatory from entering into such arrangements as he may deem reasonable with the Administration for the purpose of carrying the provisions of this article into effect; and provided also that nothing in this mandate shall be construed as conferring upon the Mandatory authority to interfere with the fabric or the management of purely Moslem sacred shrines, the immunities of which are guaranteed. Article 14 A special commission shall be appointed by the Mandatory to study, define and determine the rights and claims in connection with the Holy Places and the rights and claims relating to the different religious communities in Palestine. The method of nomination, the composition and the functions of this Commission shall be submitted to the Council of the League for its approval, and the Commission shall not be appointed or enter upon its functions without the approval of the Council. Article 15 The Mandatory shall see that complete freedom of conscience and the free exercise of all forms of worship, subject only to the maintenance of public order and morals, are ensured to all. No discrimination of any kind shall be made between the inhabitants of Palestine on the ground of race, religion or language. No person shall be excluded from Palestine on the sole ground of his religious belief. Article 16 The Mandatory shall be responsible for exercising such supervision over religious or eleemosynary bodies of all faiths in Palestine as may be required for the maintenance of public order and good government. Subject to such supervision, no measures shall be taken in Palestine to obstruct or interfere with the enterprise of such bodies or to discriminate against any representative or member of them on the ground of his religion or nationality. Article 17 The Administration of Palestine may organise on a voluntary basis the forces necessary for the preservation of peace and order, and also for the defence of the country, subject, however, to the supervision of the Mandatory, but shall not use them for purposes other than those above specified save with the consent of the Mandatory. Except for such purposes, no military, naval or air forces shall be raised or maintained by the Administration of Palestine. Article 18 The Mandatory shall see that there is no discrimination in Palestine against the nationals of any State Member of the League of Nations (including companies incorporated under its laws) as compared with those of the Mandatory or of any foreign State in matters concerning taxation, commerce or navigation, the exercise of industries or professions, or in the treatment of merchant vessels or civil aircraft. Similarly, there shall be no discrimination in Palestine against goods originating in or destined for any of the said States, and there shall be freedom of transit under equitable conditions across the mandated area. Article 19 The Mandatory shall adhere on behalf of the Administration of Palestine to any general international conventions already existing, or which may be concluded hereafter with the approval of the League of Nations, respecting the slave traffic, the traffic in arms and ammunition, or the traffic in drugs, or relating to commercial equality, freedom of transit and navigation, aerial navigation and postal, telegraphic and wireless communication or literary, artistic or industrial property. Article 20 The Mandatory shall co-operate on behalf of the Administration of Palestine, so far as religious, social and other conditions may permit, in the execution of any common policy adopted by the League of Nations for preventing and combating disease, including diseases of plants and animals. Article 21 The Mandatory shall secure the enactment within twelve months from this date, and shall ensure the execution of a Law of Antiquities based on the following rules. This law shall ensure equality of treatment in the matter of excavations and archaeological research to the nationals of all States Members of the League of Nations. (1) “Antiquity” means any construction or any product of human activity earlier than the year A. D. 1700. (2) The law for the protection of antiquities shall proceed by encouragement rather than by threat. Any person who, having discovered an antiquity without being furnished with the authorization referred to in paragraph 5, reports the same to an official of the competent Department, shall be rewarded according to the value of the discovery. (3) No antiquity may be disposed of except to the competent Department, unless this Department renounces the acquisition of any such antiquity. No antiquity may leave the country without an export licence from the said Department. (4) Any person who maliciously or negligently destroys or damages an antiquity shall be liable to a penalty to be fixed. (5) No clearing of ground or digging with the object of finding antiquities shall be permitted, under penalty of fine, except to persons authorised by the competent Department. (6) Equitable terms shall be fixed for expropriation, temporary or permanent, of lands which might be of historical or archaeological interest. (7) Authorization to excavate shall only be granted to persons who show sufficient guarantees of archaeological experience. The Administration of Palestine shall not, in granting these authorizations, act in such a way as to exclude scholars of any nation without good grounds. (8) The proceeds of excavations may be divided between the excavator and the competent Department in a proportion fixed by that Department. If division seems impossible for scientific reasons, the excavator shall receive a fair indemnity in lieu of a part of the find. Article 22 English, Arabic and Hebrew shall be the official languages of Palestine. Any statement or inscription in Arabic on stamps or money in Palestine shall be repeated in Hebrew and any statement or inscription in Hebrew shall be repeated in Arabic. Article 23 The Administration of Palestine shall recognise the holy days of the respective communities in Palestine as legal days of rest for the members of such communities. Article 24 The Mandatory shall make to the Council of the League of Nations an annual report to the satisfaction of the Council as to the measures taken during the year to carry out the provisions of the mandate. Copies of all laws and regulations promulgated or issued during the year shall be communicated with the report. 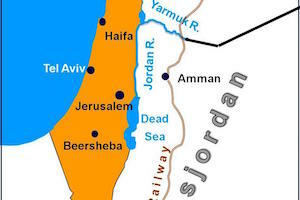 Article 25 In the territories lying between the Jordan and the eastern boundary of Palestine as ultimately determined, the Mandatory shall be entitled, with the consent of the Council of the League of Nations, to postpone or withhold application of such provisions of this mandate as he may consider inapplicable to the existing local conditions, and to make such provision for the administration of the territories as he may consider suitable to those conditions, provided that no action shall be taken which is inconsistent with the provisions of Articles 15, 16 and 18. Article 26 The Mandatory agrees that, if any dispute whatever should arise between the Mandatory and another member of the League of Nations relating to the interpretation or the application of the provisions of the mandate, such dispute, if it cannot be settled by negotiation, shall be submitted to the Permanent Court of International Justice provided for by Article 14 of the Covenant of the League of Nations. Article 27 The consent of the Council of the League of Nations is required for any modification of the terms of this mandate. Article 28 In the event of the termination of the mandate hereby conferred upon the Mandatory, the Council of the League of Nations shall make such arrangements as may be deemed necessary for safeguarding in perpetuity, under guarantee of the League, the rights secured by Articles 13 and 14, and shall use its influence for securing, under the guarantee of the League, that the Government of Palestine will fully honour the financial obligations legitimately incurred by the Administration of Palestine during the period of the mandate, including the rights of public servants to pensions or gratuities. The present instrument shall be deposited in original in the archives of the League of Nations and certified copies shall be forwarded by the Secretary- General of the League of Nations to all members of the League. 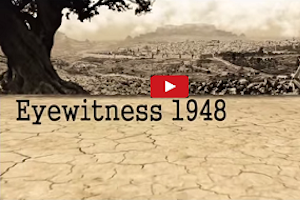 Sign the Balfour Initiative Today!